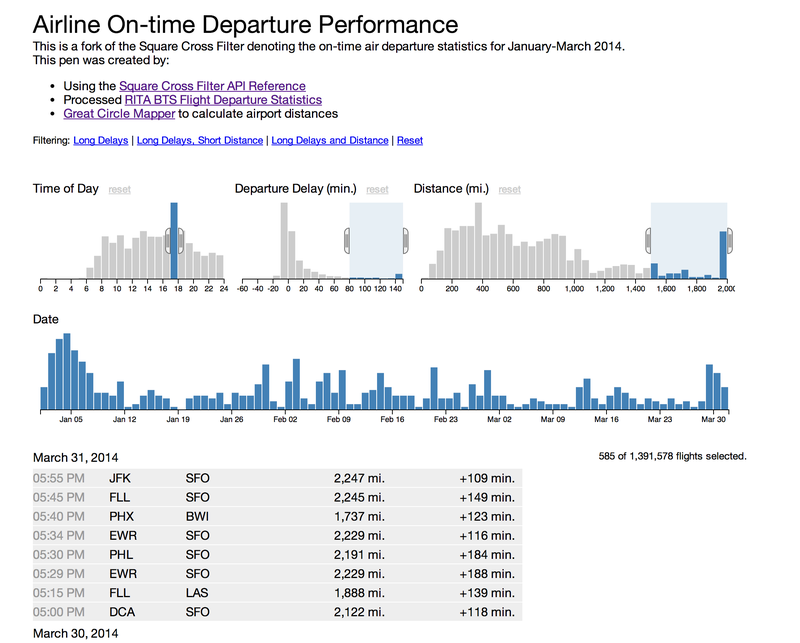 As part of some quick analysis of flight departure data, to more quickly understand the impact of distance, date, and time of day on departure delays – I forked the Square Crossfilter and incorporated data from RITA BTS Flight Departure Statistics and Great Circle Mapper to calculate airport distances. At the bottom is a nice screenshot of it, but you can interact with the data directly with the links directly below. Please note that it will take a few seconds to a few minutes to load up because of the large files d3 will process. hi denny — did you ever get codepen embed to work? not able to here, per WP.com documentation instructions. any feedback appreciated. thx. ps i notice you have a link not an embed, so my guess is not. I did not – I tried a couple of different techniques but I definitely ran into problems. If you by any chance figure it out, please do ping me on how you did it, eh? !